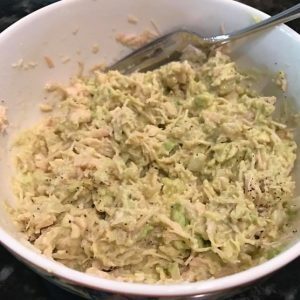 I used one avocado (takes places of mayo), a little diced onion, chicken breast shredded or you can also used canned chicken, salt, pepper and a teaspoon or so of lime juice. Mix it all together and that’s it! Easy and delicious! You might need to add more/less depending on your taste.